How can Squint be treated? Squint is a misalignment of the two eyes so that both the eyes are not looking in the same direction. This misalignment may be constant, being present throughout the day, or it may appear sometimes and the rest of the time the eyes may be straight. It is a common condition among children. It may also occur in adults. A child would ignore the image coming from the deviated eye, and thus sees only one image. But in the process, he loses the depth perception. This suppression of the image from the deviating eye results in poor development of vision in this eye, which is known as amblyopia. An adult can not ignore the image from either eye, and therefore has double vision. This can be very annoying and may interfere with work. Whether the squint is present all the time (constant), or comes and goes (intermittent). Whether the affected eye turns when the eyes are open and being used (manifest squint) or whether the eye turns only when it is covered or shut (latent squint) but looks fine when the eyes are open. A concomitant squint means that the angle (degree) of the squint is always the same in every direction that you look. That is, the two eyes move well, all the muscles are working, but the two eyes are always out of alignment by the same amount no matter which way you look. An incomitant squint means that the angle of squint can vary. For example, when you look to the left, there may be no squint and the eyes are aligned. But when you look to the right, one eye may not move as far and the eyes are then not aligned. By age of onset. Most squints develop sometime in the first three years of life. Some develop in older children and adults. Squints that develop in children usually have different causes to squints that develop in adults. In many cases of childhood squint the reason why a squint develops is not known. In some cases of childhood squint (and most cases of adult squint) the squint occurs because of a disorder of the eye, eye muscles, brain or nerves. A squint can be a cosmetic problem. Many older children and adults who did not have their squint treated as a child have a reduced self-esteem because of the way their squint looks. Adults may notice double vision, or misalignment of the eyes. The exact cause of squint is not really known. 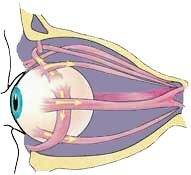 The movement of each eye is controlled by six muscles that pull the eye in various directions. A squint develops when the eye muscles do not work in a balanced way and the eyes do not move together correctly. This loss of coordination between the muscles of the two eyes leads to misalignment. This misalignment may be the same in all directions of gaze, or in some conditions the misalignment may be more in one direction of gaze, e.g., in squint due to nerve palsy. Congenital squint means that the child is born with a squint, or it develops within six months of age. In most cases, the cause is not known. (The eye muscles are not balanced but the reason for this is not known.) In most cases one eye turns inward. This is called congenital esotropia (sometimes called infantile esotropia). This common type of squint tends to run in some families so there is some genetic component to this type of squint. However, many children with congenital esotropia have no other family members affected. In some cases the eye turns outward (congenital exotropia). Less commonly, a squint of unknown cause may result in an upward or downward turn of the eye. Refractive errors include: short sight (myopia), long sight (hyperopia) and astigmatism. These are conditions that are due to poor focusing of light through the lens in the eye. When the child with a refractive error tries to focus to see clearly, an eye may turn. This type of squint tends to develop in children who are two years or older, in particular in children with long sight. 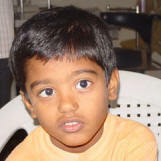 The squint is most commonly inward looking (an esotropia). Most children with a squint have one of the above types of squint and are otherwise healthy. In some cases, a squint is one feature of a more generalised genetic or brain condition. For example, a squint may develop in some children with cerebral palsy, Noonan syndrome, hydrocephalus, brain injury, and various other conditions. It is important to diagnose a squint (and amblyopia) as early as possible. Routine checks to detect eye problems in babies and children are usually done at the new-born examination and at the 6-8 week review. There is also a routine pre-school or school-entry vision check. Some newborn babies have a mild squint that soon goes. However, any squint that is present after the age of three months is usually permanent unless treated. So, even if your child has had routine eye checks, tell your doctor if you suspect that a squint has developed. A baby or child with a suspected squint is usually referred to an orthoptist. An orthoptist is a health professional who is specially trained to assess and manage children with squint and amblyopia. If necessary, an orthoptist will refer a child to an	ophthalmologist (eye surgeon) for further assessment and treatment. Constant turns must be dealt with immediately if one wants to re-establish proper use of the eyes. Treatment for this condition needs to be early and aggressive. If the eye turn is constant and simple things like patching, glasses (bifocal, prismatic, etc) do not eliminate the eye turn, either vision therapy or surgery needs to be considered. Keep in mind that surgeons like to perform surgery and often do not consider other treatment options. The best way to treat each infant/or child must be determined and discussed with the parent. 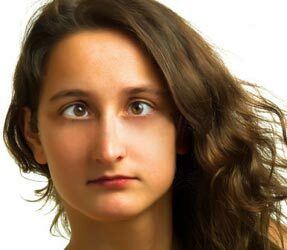 With intermittent squint, the eye does not turn in all the time, so the brain is probably receiving appropriate stimulation for the development of binocular vision. After 6 months of age, this condition does need attention, but neither the eye doctor nor parent needs to panic. As long as the eyes are straight some of the time, the brain will develop normal functioning of	the eyes (stereoscopic depth perception). Children with intermittent eye turns should be handled with judicious patching, special glasses, and vision therapy like Eyerobics. The Eyerobics program is a program of eye exercises based on the Bates Method. This is a well known method developed by Dr William Bates in the 20's. The eye exercises are designed to address most eye disorders including squint by improving the function of both your eye muscles and at the same time relaxing them. The focus on improving your eye muscles enables your eyes to re-align themselves. Eyerobics has been very effective in restoring clear sight for people with squint as well as preventing amblyopia or lazy eye, often a result of squint. "After four eye operations, 25 years in glasses and contact lenses, and still having problems I discovered Eyerobics. After he examined me, he told me my eyes were great and I wouldn't need glasses or contacts again. I couldn't be happier with the results, so simple and yet noticing each day the major improvements." Find out how Eyerobics can help you regain clear eyesight.